Stuck in your current rank? We can help you climb up or we can just do it for you with our Realm Royale boost service. If you purchase the Duo or Squad, you can familiarize yourself with the game more while playing with a booster. Or you can just let us do all the work and enjoy your division at the end by selecting Solo mode. 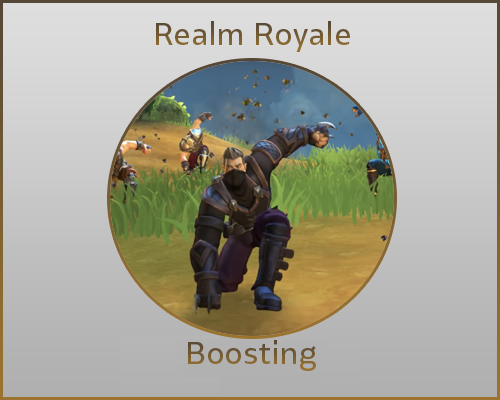 Once you buy the boost all of our Realm Royale boosters will be notified of your order so it is very likely it will be started immediately. You will also gain access to our Members Area where you can chat with your boosters and much more. Can I get banned for buying rank boost on Realm Royale? Battle royale game enthusiasts are always on the lookout for a new video game to play. They always share information on the new ones that game developers are introducing into the market, and they always welcome those that are available on the internet and are in “early access”. In this way, they can participate in the development of the game as it gets underway. If you are one of these enthusiasts, you will definitely like Realm Royale. This free-to-play game has exploration, foraging, and survival elements built into it. You can also provide feedback to the developers to further improve the battle experience. With Realm Royale, you always start the game with a 4-man squad. It is different from MOBA video games. You can choose to start out alone or in a group with these other games. However, Realm Royale lets you work with your team at the outset. This makes for a great bonding time with your friends, making it a “must-do” activity the next time you hang out together. Better yet, you can make this the reason for you to hang out. Realm Royale lets you pick from among five classes at the start of the game. You can choose to be a warrior, an assassin, a hunter, an engineer, or a mage. Each one of these has unique abilities and strengths, giving you a choice as to the physical build, agility, movement, and the whole suite of class-specific abilities. The class you pick, though, will determine how you fight your way out of the battles. The most important addition to Realm Royale not found in other MOBAs is the Forges scattered throughout the game map. Forges are crafting stations where you can make or acquire the best armors, weapons, and abilities. Realm Royale has forges in 18 different spots across the map. Another feature of Realm Royale that is also not found in other battle royale games is the “Disenchant”. This gives you the ability to turn any weapon that you see on the ground into shards. You can then take these shards to the forge. These features motivate you to continue “disenchanting” weapons even though you have already made and collected a full set of weapons. One fun thing you can experience while playing Realm Royale is when your health runs out. In Realm Royale, when you run out of health, you do not “die”, but you’ll turn into a helpless chicken, instead. Once you turn into a chicken, all you can do is run around and try to survive the skirmish around you. If you survive for 30 seconds, you return to your old character and be ready to fight the battle again. On the other hand, you have to finish off your enemy’s chicken version to fully “kill” him off. This is a goofy break to an otherwise tension-filled game level. Playing Realm Royale is a deeply riveting experience. You would want to move on to the next rank until you are the only man left standing. Most times, however, you may not know how to proceed. This is where boosting up your ranks with ProBoosting can help you. Why Boost your Realm Royale Rank? You may ask why you need a Realm Royale rank boosting. You can play this game over and over again but find yourself stuck at the same level. Or your pace is too slow that it takes a while for you to advance to the next rank. Also, you are playing in a 4-man squad, which factors heavily on the speed and success of your gameplay. By buying Realm Royale rank boosting, you have a forum where you can raise your concerns and compare your game with your boosters. Choose to just enjoy your game. Just by selecting the Solo Mode, we will do all the work for you. Get familiar with the game while playing it with a booster. You can choose the Duo or Squad Mode for this. Be sure that we will immediately start on your order. Have access to our Members Area, so you can talk with our boosters. A Realm Royale rank boost saves you time, so you can rank up easily. Your booster greatly expands your odds of winning. By buying Realm Royale rank boost, you can now have a skilled and more experienced squad member playing with you. ProBoosting is deeply committed to increasing your gaming experience. We provide you with coaching and boosting services, so you can get the most out of your gaming experience at any time, every time. We know how hard you strive at every level of your game, so you will be the only one left standing. Have a readily available support team to help you with your gameplay. Impress your friends with your rank. Save time in reaching a higher rank. Learn from your booster and acquire new skills from him. Have a better way of keeping your account secure, so you do not have to worry about losing it or getting it banned. So, why not start now? Let ProBoosting help you become a better player. Be more confident in your game and emerge as the victor.